Targeting people that already visited your website is always a smart move, but with the new Facebook Pixel, you can do much more than that. What you can actually do is to target (or exclude) people who performed a certain action on your website, like buying product X, or visited article Y, or contacted you and so on. Standard or custom events are pieces of code inside Facebook Pixel that are telling Facebook that a visitor of your site has performed an action, like visiting a page or clicking a link. Every event can have parameters, an additional set of data that you can furtherer use. Let’s take for example a Purchase event (triggered when someone buys something from your website), it can have value, currency, order id, but also items IDs. So when you are creating a Custom Audience you can tell Facebook that you are interested only in users that bought the item with a certain ID, or with a value bigger than $100. Standard Events are a set of predefined events that Facebook uses. They are nine, and PixelYourSite plugin has all of them available for selection. Custom Events can be created by you and can have any name you like. 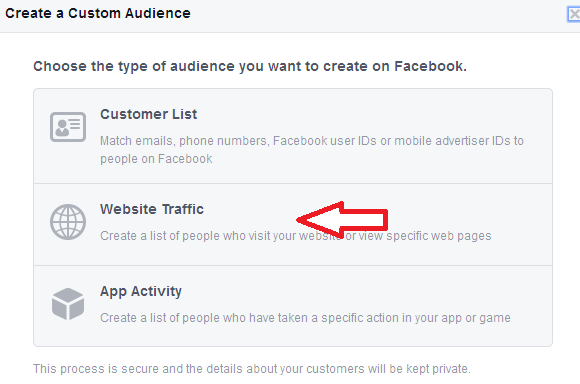 Facebook lets you create Custom Audiences, that you can define by various criteria. On important option is to use events, meaning that the audience will contain people that performed a certain action on your website. Important: In order to use this tool you have first to set up events on your Website. You can do this with ease by using PixelYourSite plugin. It lets you define both events on page load and dynamic events. There is also a WooCommerce option that automatically adds all the necessary events with just a few clicks. 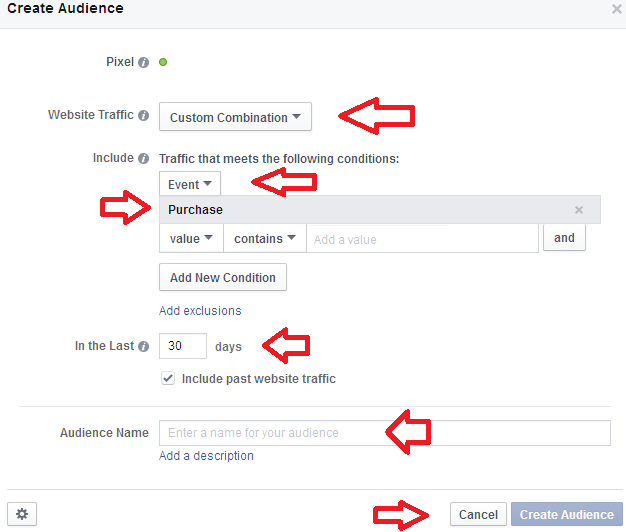 Once the events start to trigger, they will be available for selection in your Facebook Ads admin area. You can now start to use them in a very smart and efficient way. The most obvious thing you can do is to target it in your ads. It will be very good idea to target people that made a purchase worth more than $200, for example, because they probably are good consumers. Or you can target people that registered to your newsletter (you will need a Dynamic Event on the register button). You can target every person that performed a search on your website and you can tell Facebook what the search contained, let’s say every person that searched for blue shoes. The imagination is the limit here, really. Another smart thing you should do is to exclude some audiences from your campaigns. Assume you have an ad for a product. What you want to do is to exclude from your targeted audience people that already bought that specific product. Doing so is very simple: create a Custom Audience from your Purchase Event, select content_ids parameter and add the ID of your product. In your add settings simply exclude this audience. This is just a small example, but you should carefully plan what audiences to exclude because this is almost as important as what audiences you are targeting and can be crucial for the efficiency of your campaigns. As you can see, the new Facebook Pixel is a small but powerful tool and can have many ways of being useful.